HARARE – Zimbabwe’s main labour federation called on workers to back MDC Alliance presidential candidate Nelson Chamisa in tomorrow’s election. The ZCTU, a key ally of the MDC, said its general council — the highest decision-making body in between congresses — met on Monday and noted that the current military-backed government cannot be expected to solve the country’s problems. Tomorrow’s key election in Zimbabwe is the latest turning point in what has proved the most tumultuous few months in almost four decades of the country’s political history. In November, Robert Mugabe was forced out of power after 37 years, following a peaceful military takeover supported by the vast majority of the 13 million population. The poll pits Zanu PF, the ruling party, against the Movement for Democratic Change (MDC), the long-standing opposition. Zanu PF is led by President Emmerson Mnangagwa, a former vice-president nicknamed Crocodile, who took power when Mugabe was ousted. Polls indicate a potentially close race. ZCTU said it believed that a party with pro-labour policies and background is the best foot forward. “We had fantastic interactions with a number of political parties whom we invited and who attended our labour forums around the country. “Although we value the contributions of other opposition political parties and presidential candidates, in our view the MDC Alliance provides a realistic chance for achieving the change we all want,” ZCTU president Peter Mutasa told a news conference at Gorlon House in Harare. “We are therefore calling on all workers and Zimbabweans in general to come out in their numbers and vote for change. This can only be feasible if we all rally behind one candidate who has a real chance of winning against the incumbent. In our considered view, this is …Chamisa of MDC Alliance. We kindly ask our members, workers and citizens to spread this message by convincing all our relatives and friends across the country to vote for change. The president for the largest trade union federation also called upon the workers and Zimbabweans in general to safeguard and defend their vote through any peaceful means possible. “Finally, July 30 has been declared a national holiday and all employers are compelled to release their workers to go and vote. “The ZCTU takes exception to employers who deny workers their right to vote,” Mutasa told reporters. The ZCTU, together with 40 other civic society groups formed the MDC in 1999 after it organised the “Working People’s Convention” towards the end of February 1999 at which they agreed to form a broad-based movement to fight for political change. The new movement was mandated with promoting labour issues and bringing to the fore those issues which the government had failed to promote. A number of labour leaders and trade union activists were then tasked with mobilising the masses to embark on a national sensitisation campaign to drum up support for the new movement. This movement culminated in the formation of the opposition political party, the MDC on September 9, 1999, at Rufaro Stadium in Harare. ZCTU highlighted a number of electoral irregularities, and said the war of liberation was fought because of, among other issues, the right to one man one vote. “It was hoped that those who directed the liberation struggle would deliver change and freedom to the people of Zimbabwe. What has been happening over the years on the electoral field negates all this, more so after November 2017 promises,” Mutasa said. “We therefore call upon international and regional observers to take particular notice of these electoral malpractices which hinders the achievement of free, fair and credible elections. 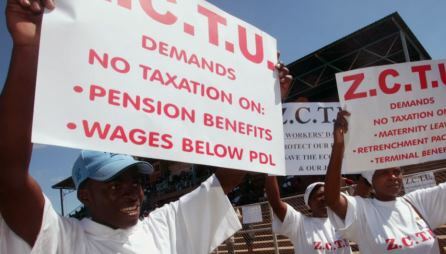 The ZCTU has in the past staged nationwide strikes and job walkouts to protest the government’s policies.